We are undergoing what could only be described as an unprecedentedly gigantic amount of snow here in the Boston area. The total stands at 71″ (aka over 5.5 feet) in the past 19 days with more predicted to fall. In case you were wondering, this quantity of snow yields snowbanks taller than two Frugal Hounds stacked on top of each other (now that’s a lot of hound). It’s been snowfall after snowfall in a gloriously epic saga of what’s beginning to reveal itself as a never-ending blizzard of, well, snow. I’ve already confessed our unabashed adoration of these wintry months and our fervor has only intensified with these most recent outpourings of, well, snow. You’d think we’d be longing for a tropical island, but no, we’re hoping for more snow! Unbalanced? Perhaps. You see, excessive snow strikes at the core of something Mr. Frugalwoods and I hold dear: self-sufficiency. There’s a great deal of self-reliance that goes into successfully weathering this type of battering storm, which has been born out in Mr. FW’s daily (sometimes hourly) shoveling of our loooooong walkway to the street, unearthing our car from snowbanks (repeatedly), knocking icicles off our gutters (moderately terrifying), and just the general idea that you need to take care of yourself and not pay other people to do every little thing for you. A major caveat here is that I acknowledge we’re lucky to be young and in good health and thus able to accomplish these tasks. Furthermore, the region has been incredibly fortunate not to suffer significant power outages. One of the things we dislike about city life is that we’re entirely dependent on the grid. We have no fireplace, no woodstove, no solar, no wind, no well, no composting toilet… we’re as city slicker as you get because we have no other option in our dense, urban environment. 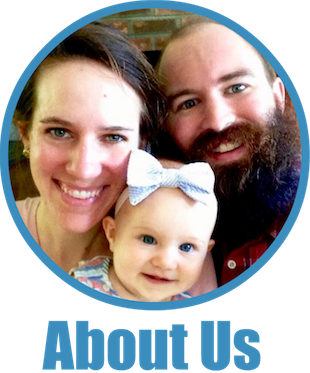 This is a huge motivator behind our homestead dream. We crave the sufficiency we’ll have once we’re able to heat with wood, rely on our well and septic, and hopefully have a solar array and possibly wind power as well. But for the time being, we’re enthralled with our mini self-sufficiency experiment amidst this snow-fueled wonderland. Something I struggle to understand are the complaints I hear from colleagues and neighbors about so-called “cabin fever” and how “bored” they are being stuck inside with their families. It’s all I can do not to retort, “are you kidding me? !” It’s my dream come true to be “stuck” at home with the love of my life and our hound, working on projects that are meaningful to me. What’s boring about that, pray tell? 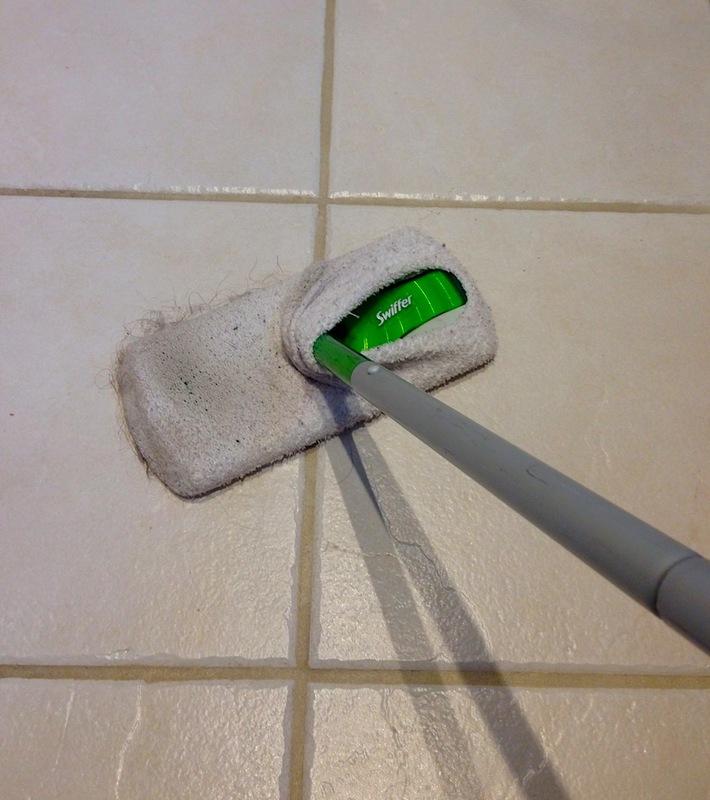 Learned that you can use a fuzzy sock as a swiffer wipe. Earth shattering discoveries here, people. Baked pumpkin oatmeal spice cookies*. Hosted a frugal dinner party with frugal friends. Did yoga at home (with the slightly odd Pandora “yoga” station… let’s just say there were a few too many pan flutes for my taste). Conducted homestead research (did you know that some trees in central New England are more fire resistant than others? I do now). 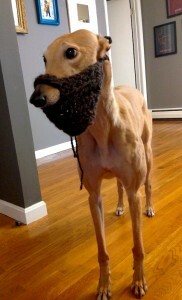 Tried a faux beard on Frugal Hound, which Mr. FW’s aunt kindly knitted for us (thank you, Aunt R!). Wrote stuff for you fine folks to read on this here interwebs site. Baked focaccia bread (Mr. FW did, that is). Read books of assorted and sundry types. Mr. FW gave me this home haircut! Have embarked on a project to teach Frugal Hound how to high-five. Results thus far are mixed. Embraced the season for what it is. It’ll be spring soon enough. Might as well relish the moment. *Untrue to my normal free-styling form, I actually followed this recipe for the pumpkin oatmeal spice cookies to a T and they turned out like perfection on a baking sheet. They are beyond delicious. BEYOND I tell you. Hello, I’m not really drinking this wine. I will confess that this amount of snow doesn’t come without a few grumbles. Firstly, we’re running into a problem of where to put the snow… there’s so much of it at this point that we’re all out of space to relocate shoveled snow to. Mr. FW has ingeniously devised a snow mountain (referred to affectionately as “Snountain”) on our pip-squeak concrete patio, but at 8 feet tall, Snountain can’t hold too much more. The other grumble we have is that drivers aren’t terribly nice to Mr. FW as he bikes to work these days. Since the bike lanes are entirely populated by snow, he has to bike in the car lane, which makes some impatient gas guzzlers twitchy. Despite their rudeness, he persists. But on the whole, we delight in the alteration of our world that snow brings. It’s good to experience different challenges and temperatures and circumstances. Call it character-building or just call it living in the moment, either way, we’re enjoying ourselves. After all, why not? Bloom where and when you’re planted (even if it’s in a snow bank). P.S. Another foot of snow is predicted to fall on Sunday… and again on Tuesday… we’re in it to winter win it! P.P.S Wondering how Mr. FW and I are celebrating the holiday that occurs tomorrow (aka Valentine’s Day)? Wonder no more. Do you get cabin fever? What are your thoughts on snow generally? Are you jealous of our Snountain? Actually I like snow but it is a rare occurrence where I live in AZ. At least your snow is still white – I get grossed out when snow starts to turn brown and icy near the streets when it builds up and does the melt a little freeze again cycle. I think our weather here is going to just be snowy for the foreseeable future, possibly until the spring :). Be glad that I did not include all the photos of the brown/icy/slushy snow… but rest assured, there’s a ton of it! I’ve seen that you can crochet Swiffer wipers! That is something I’ve been meaning to do. I totally get your desire for self-sufficiency. When I lived in an apartment in Chicago, I would worry a bit during the big snow storms about power outages, and then about whether or not I lived in a building with people who were doing careless things with fire to try and stay warm. It is nice having a way to heat your house, and supply your basic needs without depending on a giant infrastructure. I love the snow beard, so cute! I have an idea for a future post. I would love ideas of what you eat for dinner. We are big meat eating family, especially since we get “practically free” meat with hunters in the family. But I would love vegetarian ideas, plus I’m interested in what you eat as mostly vegetarians, in general. Thanks for the request! I’ve written some about our dinners in this post: Why We Don’t Meal Plan. But mostly, it’s a rotation of homemade hummus with raw vegetables, salmon with salad (that’s the only meat we buy), and then whatever Mr. FW decides to cook on the weekends–perhaps split pea or lentil soup, quinoa with veggies, pasta, scrambled eggs, or homemade guacamole. Hope this helps :)! I am jealous of your snow! I love playing in the snow with the kids and we have not really had any playable, buildable snow this winter. We are on the same page on self-sufficiency. There is something about knowing that we have the skills to take care it ourselves. I love that feeling of being able to do things for ourselves–it’s very empowering! I do understand the housebound comment but only because I’m the mom of two young children. The temperatures here have been swinging pretty low in the -15 to -26 range with the windchill (sorry Celsius I don’t know fahrenheit or how to spell it) which makes it too chilly for their faces to spend much time outside. The house gets pretty small pretty quickly when they need to run around to blow off steam! These days we do a lot of mall walking (running) to ride up and down escalators and watch the pets at the pet store. Mall running sounds like a good idea! I was just thinking the other day that I wish there was somewhere indoors we could take Frugal Hound for her to run around, but alas, I can’t think of anywhere. I can imagine the cabin fever situation is definitely more challenging with little ones! Good luck to you for the rest of the winter! I commend you for being able to weather the storm(s) with a smile! My job’s been pushing everyone to work every day, and since I can’t do much from home I’ve been commuting in ever day (except the one day with the really bad blizzard) That plus the funny business with the T has been non-ideal to say the least. Ugh–that’s too bad! Our employers have been great about following the mayor’s requests for people to stay off the roads, which is what has made it so nice. And, Mr. FW and I can work from home, so we’ve been doing a lot of that lately. I’m sorry you’ve had to battle the T, that’s a huge pain. And… it’s going to start snowing again soon! I hear you on the hostility to bikers increasing in the winter, despite there being so few of us, and usually the ones who are crazy enough to bike through the winter are the most law-abiding. Our snow this winter has actually been pretty pathetic. Though at least it’s stayed cold, so we don’t have endless freeze/thaw cycles that damage…everything. I have to say I’m a bit jealous of all your snow. We have maybe 18″ or so… I love the quiet that the blanket of snow creates. (more in the country than the city, I guess!) What we do have here is exteme, unrelenting cold. This morning was -27C with a wind chill of -38C (-16F and -34F!). We have had temps similar to this since early Jan. Going outside for too long is tough, even when dressed for it. We are also trying to housebreak a new puppy and her little paws freeze up in minutes! Really stinks you don’t have a fire place in your home. That can make weathering the storm a ton easier. But I know you’ll make sure to have at least a couple in your homestead! Preschoolers get cabin fever, ergo we do, too. Last year was the most awkward because Little Brother, one and a half last winter, was too small to really play in the snow, but was old enough to get quite restless. This year he can navigate the snow better and get some exercise. Happily, snow exercise is more quickly exhausting then sunny exercise, so it doesn’t take too long. We’re heading to the Boston-area to see my sister this weekend. (Okay, and to take the kids to see Frozen on Ice tomorrow.) We planned to stay all weekend, but thanks to the blizzard warning tomorrow evening through Sunday evening, we’re heading straight home after the show. Not ideal, but we’re making the best of it. 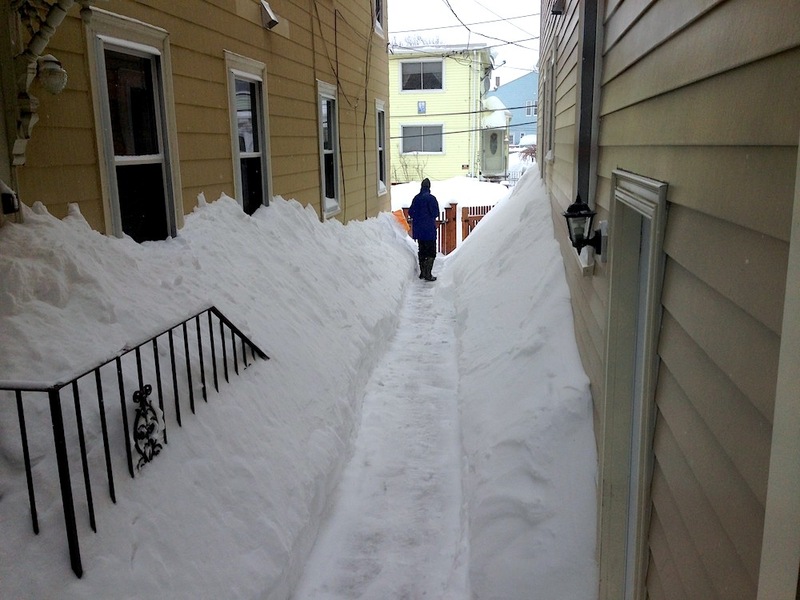 Good luck with your Boston trip–hope you make it out before the next blizzard :)! Yeah, we’re both still commuting to work and Mr. FW is traveling out of town for work this coming week, but we have been able to work from home a few days which really helps! 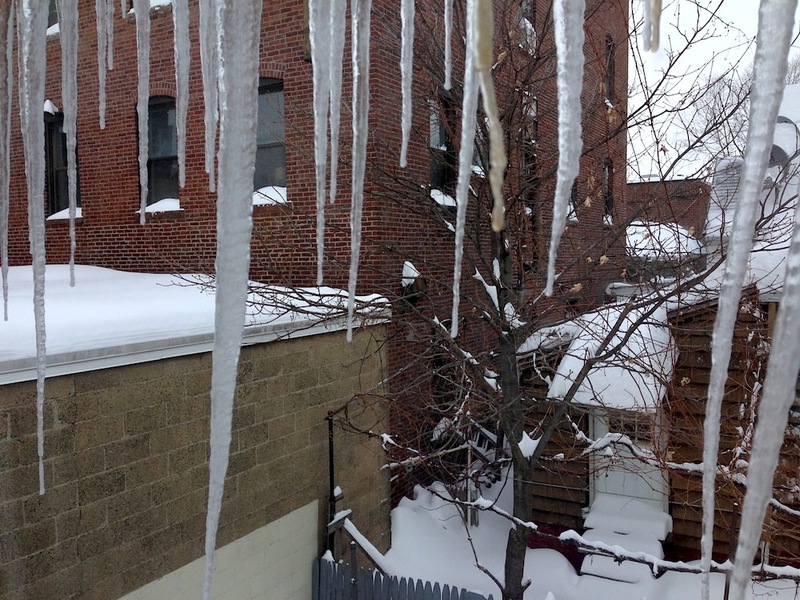 Beware of icicles. Whenever I see them, the first thing I think of is ice dams which will damage the roof. Dams are caused by an attic that is too warm because it doesn’t have enough insulation or air leakage (can lights are a common culprit). In any case, you may want to lake a closer look at your attic. Yeah, we have some ice damming but not too bad. Nothing leaking. There are some really horrible cases in the neighborhood though! It does remind me that we’ll need to do some gutter work in the spring though. It’s a bummer, because I don’t have a ladder high enough (needs a 30 footer). Take that van on down to Home Depot and pick up a bunch of cubes of cellulose insulation. 🙂 They let you have the blower for free if you buy a certain amount. Insulating the crap out of the attic is the very first thing we do whenever we buy a home. I think looking at that huge pile of snow is enough for my delicate southern tastes. Yesterday it was 55 degrees and sunny here and I had to take off my coat and hat it was so warm. Bravo to Mr. Frugalwoods for continuing to bike in that madness! Does he not ever get into trouble just trying to bike over that? And how far does he have to go? My commute is short, about 6 miles round trip. The roads are plowed pretty well, so traction isn’t an issue. The main problem is just a lack of space in the lane. But everyone has to slow down anyway… so it’s not that bad. I actually find comfort living in the city for the same reasons you don’t. The gas will always be there, no worries about running out of heat. And though I hate the plows for pushing snow back on my beautiful sidewalk, city streets do seem to be the second priority after highways. The country, not so much. If the electricity goes out, where do they fix first? The city, because they can help the most people at once while the far flung towns have to wait. And power outages are fun, like a field trip! I like your city optimism! One of our major hassles with the city is just the absolute lack of space. We don’t have a parking spot or a garage so we’re at the mercy of precious few street parking spots. And, there’s nowhere to put our snow… but, you do have a great point about being able to rely on some services! Looking forward to your beating winter blues post! This snow is ridiculous, but you do live up there so I don’t feel too bad. I’m glad you’re not grumbling too much! We haven’t had one significant snow storm here in MD. I got to make a snowman with my daughter one time and it was melted the next morning! You guys could probably make an army of snowmen and little snow families too. Stay warm! Snow is really just a part of life up here, so we try to take it in stride and focus on the upsides of it :). Glad you got to build at least one snowman! I’m jealous of the snow for about five seconds. 🙂 Even as a kid I did like snow, but dreamed of living in a warmer climate. I was always jealous of my cousins who grew up in Orange County. But it sounds like you both love the season and embrace it, which is awesome! Even as an introvert I do get cabin fever. There is only so much time you can spend with your cat, especially if you hate cooking. 🙂 Plus I already work from home by myself. I think “embrace it” is the perfect way to put it ;). We feel like we’d better embrace and enjoy the inevitable! Have fun in the sun for me this weekend! “referred to affectionately as ‘Snountain'” Lol, I love it! That is a massive amount of snow! Three or four years ago we got about 6 feet dumped on us within about a 10 day period and remember running out of places to put the stuff and we’re not right in the city so I can only imagine what it must be like there. Sorry to hear about the hostility from the drivers towards Mr. FW. I’m not much of a biker myself, save for our exercise bike, but we have a good friend who bikes a ton and had someone throw a full bottle of soda at them while he was biking a couple of months ago – it just makes you wonder what goes through the minds of some. That’s terrible that someone threw a bottle at your friend–I just don’t understand why people are so mean to cyclists! Last night we spoke to my brother and sister-in-law who live in Boston and my brother said he was started to feel like Jack Nicholson’s character in The Shining. It’s crazy how much snow you have gotten and I just saw the blizzard warning for this weekend. At least you find ways to entertain yourself! How on earth is Mr.FW biking??!! I did read that post on how he does it, but it is mind boggling. I live in Northern Alberta and I gave up biking in the winter since I didn’t trust the other drivers. You see a car accident daily with these conditions, so I am too nervous to throw a bike into the mix. But definitely impressed. You guys have far more snow than us and to hear that Mr.FW is commuting to work in this is impressive. I bet even MMM would be floored. I just take it slow, and I’m not afraid to take the entire lane of traffic. I think that’s essential when the roads are narrowed by lots of snow. There’s just not enough space for a car to safely pass me for most of my route… so I make it impossible for them to try. I don’t envy the amount of snow you’ve gotten that’s for sure. We had a blizzard yesterday and I currently have about three feet of snow inhabiting a good part of my driveway and walk way. Perhaps you could send Mr. FW over to help this single gal who lives alone get through the snow. Ha ha. Luckily I did have a visit from a snow blower fairy who helped me clear the huge mountain of snow out from in front of my car so I could get to work this morning. Oh no! I would definitely lend you Mr. FW to help out with shoveling! I hope your snow blowing fairy returns if you get more snow. My favorite part of snow is looking at it from inside a nice warm house – preferably with a warm beverage to sip. I’m a big ol’ weenie when it comes to being cold. There is a reason I’ve stuck to living in the south. But it is just beautiful when so pristine and white. We are homebodies so I don’t mind staying in for days on end. The creative juices do have to get going though to keep Mini Maroon #1 entertained though. Fortunately he does like to do puzzles and read books. He’s also a big fan of cooking – and a big fan of eating too – so rainy / cold weekends when we can’t go outside typically end up with lots of cooking! Stay warm!! That’s what my family keeps telling me :)! He’s managing OK–the streets are mostly cleared, so he just cycles in the car lane. We do love having a real winter, it’s true :)! I hate snow and you probably already know this trick but I have some advice for when you get dumped on. 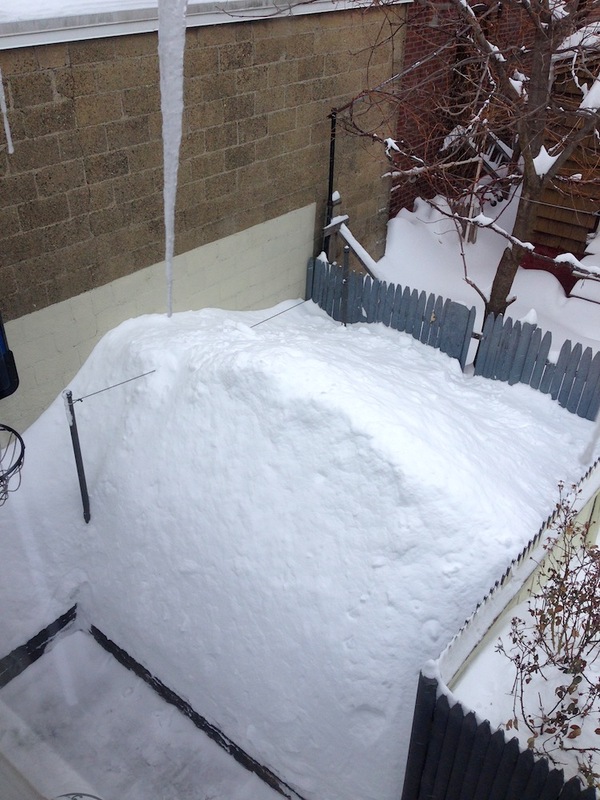 When the melt begins shovel as much snow away from your homes foundation as possible. With a flash melt and ice/snow still blocking the sewer grates the water has no where to go and it will end up flooding your basement. We had major snow in Canada last year and I remembered to do that and saved our basement carpets. Yep, we have a drainage system in the back of the house that I clear after every storm for this very reason. Hopefully we’ll have a gradual warming spring though… with 70+ inches of snow on the ground a heavy rain would mean we’d all need canoes! I can never understand how people say they get bored when stuck inside on a snowy day. Maybe these people are just bored out of their minds because all they have watched all the TV shows? Have you guys tried playing board games while stuck inside? They are awesome. I don’t understand boredom either! There’s so much to do and learn in life :). We do play board and card games–definitely a good source of frugal entertainment! Want me to mail you some snow ;)? That is a lot of snow. I love the idea of being snowed in…but don’t know that I would actually like it in reality. Glad you guys are able to find joy in such a situation. We’re trying to just take the snow in stride and enjoy this season of life :). The weather will change soon enough, might as well have fun while it’s here! That is an insane amount of snow! It’s honestly hard for me to fathom snow that is taller than I am. I am not a fan of cold weather, especially snow, so I would not do well in that situation. I don’t think I’d mind being “stuck” at home too much though. Actually, I’d love to have an excuse to just stay at home reading books, drinking wine and playing with the pup. Good luck with finding a place for the additional impending snow! 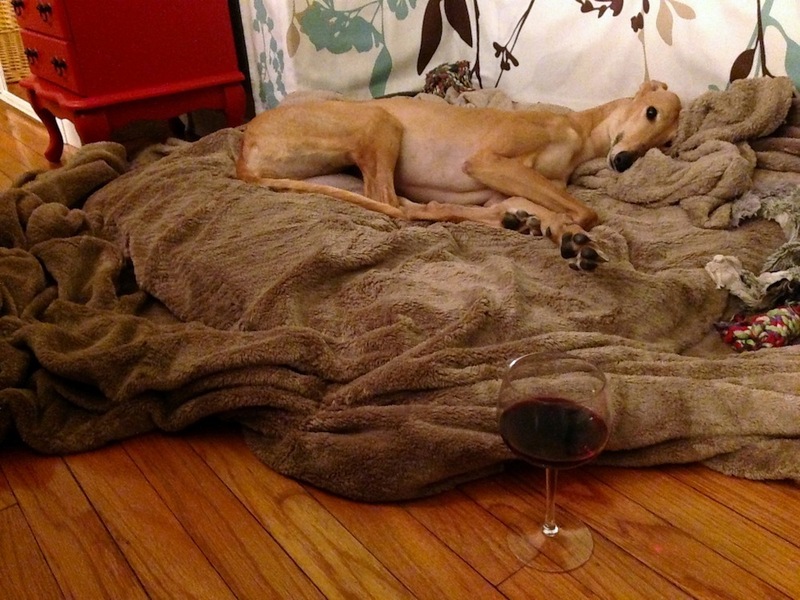 I tell you what, staying home reading books, drinking wine, and playing with Frugal Hound is basically my ideal life :)! I would totally share our Snountain with you–it has gotten bigger in the last few days! I love that cabin fever isn’t in your vocabulary, that’s awesome! Thanks! Yeah, we feel like since we live here, it’s smart to enjoy it! We are very envious of your amount of snow! Did the whole town get a snow(s) day from work? It’s been a sad year of snow here in Utah. We’ve even hit new record high temps (65???). The ski resort is still open and has snow, but as you drive to it, the canyon is very brown from lack of snow. We do love a snowy winter – more for backcountry skiing (we met, and also got engaged while backcountry skiing, almost considered getting married on skis). We even winter camp in a homemade igloo far up in the mountains (Ice Box is the brand of the kit). I would say no cabin fever here. We did indeed get a few work-from-home days thanks to the snow, which are ideal in my book! I’d rather work from home any day :). Your snow adventuring is absolutely awesome–I’m so impressed! I would love some of that snow. We’re unseasonably warm. I have to applaud Mr. FW for biking. I would have surely sought out other transportation at this point! I’ve got a case of cabin fever. We’re a few hours north and when the HIGH for the day “feels like” -30celsius I don’t really want to go outside! It’s not every day, but I’ve had to comfort a crying toddler as her hands thaw out enough lately that I can’t wait for spring! Keep being positive guys, it helps me reading when I read about your love of snow! We try to be! It’s kind of the only way to get through this type of weather with a good attitude :). Enjoy your sunshine! Can’t say I agree with you there. I think there’s a difference between being prepared for something and then actually hoping that something strikes…especially when it’s already struck multiple times recently. That said, I’m a baby when it comes to cold and snow, which is why I’m appropriately living in Florida. Keep up the great work with the self-sufficiency, though. That’s a hallmark of your plan over there. More self-sufficiency means you need less money/passive income to get by. Totally agree on the value of self-sufficiency. Everything we can do for ourselves is just one more thing we don’t have to pay for. Plus, we love the aspect of learning new skills/hobbies. I think with hoping for more snow, we’re just trying to embrace the inevitable :). I grew up on an island outside of Seattle, and while we didn’t get a lot of snow, we certainly got our fair share of days-long power outages! That included outages to our hot water heater and electric over, but luckily my dad was smart enough to stock enough wood to keep us warm through our small fireplace. Glad you three are enjoying the snow! Power outages are a whole different ballgame–and a huge pain! That’s great that you were able to stay warm with wood. It’s so nice to have an alternative in a region like that! I am glad you are doing well in all that snow. But it sounds like you have more than you can ever use or need so puhleeeeze send some of it down to us snow deprived Virginians. Not a 5’5″ blizzard, mind you, but a nice cushy 6-10″ would be so welcome! Looks like you must have sent it Express mail! We’re supposed to get about 10″ of snow tomorrow! 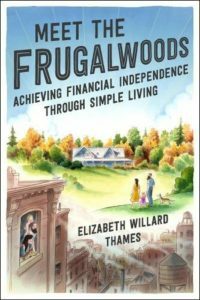 I have really enjoyed reading about your frugalness and life style changes. I was born & raised in MN, (now live in NE OH) and there were some winters in MN, where my family had the same problem (living in St. Paul) of WHERE to put the snow! I have old B&W photos where the snow on the boulevard is higher than my Dad’s car! **** QUESTION: Where is the recipe for the BAKED PUMPKIN OATMEAL SPICE COOKIES???? Those sound like a yummy, healthy winter cookie! THANKS! Hi Barb! 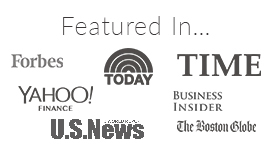 Thanks so much for reading :). MN is definitely an intense winter zone! Gosh, where I live it would really help if I could have the same attitude about snow that you have …. unfortunately, we are “blessed” with it too often and in too much volume for me to work up that kind of enthusiasm for enjoying it. We do however, not mind being snowed in, as long as we aren’t missing an important family event (grandkids concerts, etc). Maybe we need a puppy. We do enjoy the time at home, always lots to do here. Love your blog, and the photos of that hound! It’s definitely good to enjoy the snowed in state ;). I agree with you–there’s always plenty to do. Thank you so much for reading! The winter of late 1977/early 1978. I was eleven and growing up in New Jersey. There weren’t blizzards but it was BITTERLY cold and we’d get snowstorms. Eight inches here, six inches there, repeat, repeat, repeat. My siblings and I were delighted to get out of school for two straight weeks because of the snow and cold. My father put an addition on our house where the windows of our bedrooms were nine feet above the ground. One morning I woke up and looked out the window AND THE SNOW WAS ABOVE THE WINDOWSILL THAT WAS NINE FEET HIGH. 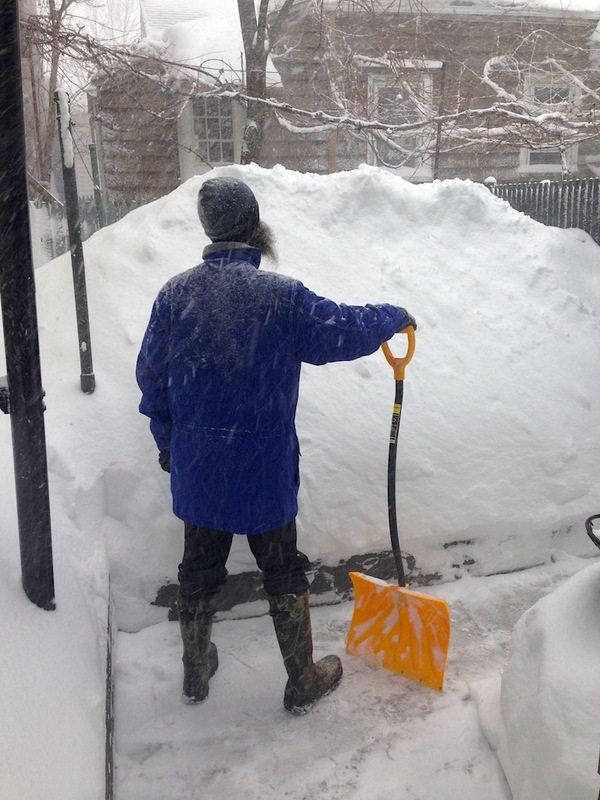 My mom took a picture of my dad on the sidewalk that led to the driveway and the snowbanks on either side were nearly twice above his head. I still remember the DJ on WABC out of New York saying one morning “it’s a warm balmy TWELVE DEGREES!” (seriously, the warmest it had been in weeks). Eventually things died down but you know how snow gets shoveled around lightposts at the mall? That year it didn’t totally melt until JULY. NOT KIDDING. Now I live in Richmond, Virginia, where, no lie, the schools get closed sometimes if there’s even a HINT of snow. Tonight there was a snow shower combined with heavy winds (gusts up to 50 MPH). At least tomorrow’s Sunday so I won’t have to deal with Instant Idiots (Just Add Snow!). 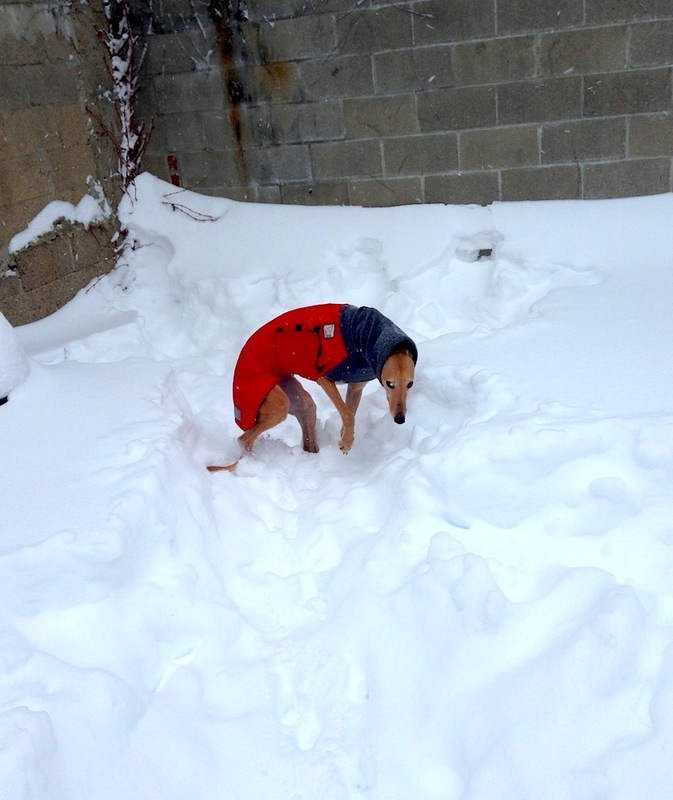 Stay safe and warm up there and snuggle Frugal Hound. I do have to admit I am getting a little snow fatigued. Partly, b/c they keep cancelling school and it kinds of screws up my schedule for my students. That and I am the only one shoveling right now and we are also losing places to put the snow. Although, we don’t have quite as much (only 55 inches). Keep digging! I can imagine the school cancellations must be super frustrating for teachers/students/parents. I know that some of the universities here have asked professors to truncate their courses for the semester because of so many snow days. That is not a good position to be in! Good luck to you! I’m glad you all are staying safe and warm despite the massive amounts of snow! Now that I work from home, I honestly wouldn’t mind the snow much. Watching it fall is rather peaceful. The worst part is shoveling and trying to drive around when the streets are so poorly plowed. Also, I love Frugal Hound with a beard! Yay for being cuddled up at home! I also love being stuck at home and I love winter (although we are certainly running out of places to put all this show in Buffalo). I would much rather be in the cold than in the hot, sticky summer. Plus it gives me time to bake, read, work on blog posts, etc. We also got tons of snow here in Chicago, but not nearly as much in Boston! When I first saw pictures of the snowfall in Boston, I thought it was a joke! I cannot complain now with the amount of snow I’ve gotten here in NJ. In the past couple weeks I’ve shoveled about 6 times all different types of snow from the light fluffy stuff to the compact wet snow. Ha I miss CA at times. At least snow shoveling is good exercise :). Mr. FW has been getting quite the workout around here! I’ve just discovered your blog and I’m working my way through your archives. I find I can relate to your writings so much! Especially this: “It’s my dream come true to be ‘stuck’ at home with the love of my life and our hound, working on projects that are meaningful to me.” I wish I could focus more hours of my life on things that are meaningful as well.